This in-depth study of the history of the cyclorama discusses every aspect of this treasure, which was first displayed in 1884 and underwent a massive restoration in 2008. Coverage includes not only how it was created and what it depicts, but the changes it has undergone and where and how it was moved. Authors Chris Brenneman and Sue Boardman also discuss in fascinating detail how the painting was interpreted by Civil War veterans in the late 19th Century. With the aid of award-winning photographer Bill Dowling, the authors utilized modern photography to compare the painting with historic and modern pictures of the landscape. Dowling’s remarkable close-up digital photography allows readers to focus on distant details that usually pass unseen. Every officer, unit, terrain feature, farm, and more pictured in the painting is discussed in detail. Even more remarkable, the authors reveal an important new discovery made during the research for this book: in order to address suggestions from the viewers, the cyclorama was significantly modified five years after it was created to add more soldiers, additional flags, and even General George Meade, the commander of the Union Army! With hundreds of rare historic photographs and beautiful modern pictures of a truly great work of art, The Gettysburg Cyclorama: The Turning Point of the Civil War on Canvas is a must-have for anyone interested in the Battle of Gettysburg or is simply a lover of exquisite art. Chris Brenneman, Sue Boardman, and Bill Dowling are Licensed Battlefield Guides at the Gettysburg National Military Park.As part of his job working for the Gettysburg Foundation, Chris Brenneman has spent hundreds of hours studying the Gettysburg Cyclorama and identifying the amazing intricacies within the painting. 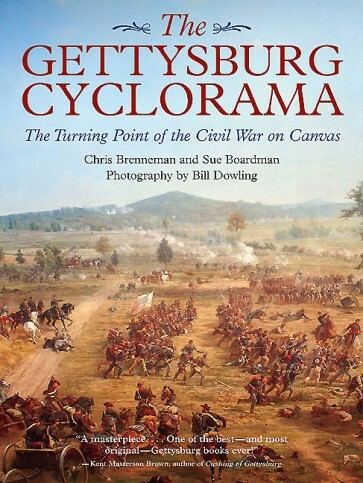 Sue Boardman was the historical consultant for the Gettysburg Foundation for the massive project to conserve and restore the Gettysburg Cyclorama, and is the author of several books and articles. Bill Dowling is an award-winning photographer specializing in historical landscape photography, with a special interest in the Gettysburg battlefield. Bill’s photographs have been published in many books and magazines, and have appeared on the Jumbotron in New York’s Times Square. "For generations, millions of Gettysburg’s visitors have experienced ‘Pickett’s Charge’ through the canvas of Paul Philippoteaux’s massive Cyclorama. But the full story of the painting’s creation, restoration, and ongoing interpretation has never before been fully told. Authors Chris Brenneman and Sue Boardman, along with photographer Bill Dowling, have used their behind the scenes access to create a colorful and lively guide that will appeal to Gettysburg students, scholars, and lovers of fine art.”"